Ideal for gas pumps, vending and outdoor kiosk applications. The Spectrum Air's unique chassis design greatly reduces the possibility of leaks developing over the life of the product. The Spectrum Air dual heads are embedded with a flex circuit, which is intrinsically easier to seal than heads with wires. 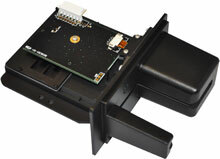 The Spectrum Air card seated switch is magnetically actuated and immune to contamination and corrosion. It utilizes IDTech's superior decoding electronics for optimum reading reliability.